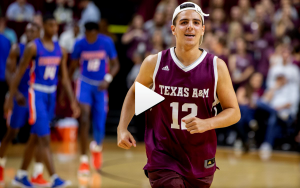 College Station, Texas – Congratulations to Texas A&M freshman Hunter Prabhu who won $10,000, courtesy of Mountain Dew and paid for by Odds On Promotions, in a half-court basketball shot promotion at Reed Arena during the Texas A&M Men’s Basketball season opener against Savannah State. Watch his winning shot. Prahbu was randomly selected during the women’s basketball game, which took place earlier in the evening, to participate in the big-prize timeout promotion. He got three chances to make the half-court shot, draining it on his 3rd and final attempt. There’s still plenty of time this season to add an exciting, on-court big prize basketball contest to engage your fans and sell more sponsorships. Click for more information or give me a call today at 800-771-0250. Kristen Carter is the Marketing Assistant for Odds On Promotions and their sister company, Hole In One International. She held this position from 2011 to 2013, then returned to the company in 2016. Kristen assists with email marketing, blog posts, social media, and video editing/production for both companies. This entry was posted in Basketball Contests & Promotions, Prize Insurance Winners, Sports Contests and Promotions. Bookmark the permalink.